Aside cash crops, the farmer also focuses on poultry, Guinea fowl, sugar cane and a chain of locally demand crops in line with Ghana’s food security policy. Prince Charles did not make any policy statement but appeared to have been encouraged and impressed with Brefo’s achievement in seven years. Ghanaian cocoa farmers have appealed to Prince of Wales to use his first-hand experience on Ghana’s cocoa farm to lobby for higher prices of the commodity on the international market. 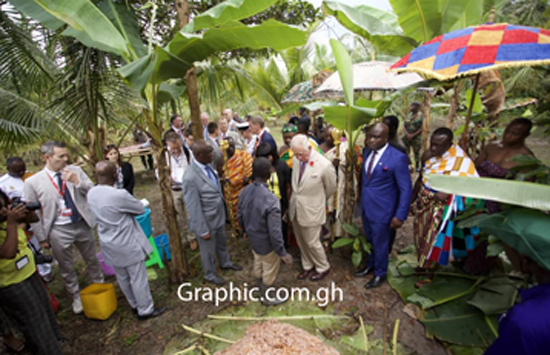 Prince Charles was on a model cocoa farm at Kona in the Ashanti Region as part of a state visit to Ghana. Forty-one-year-old Agyen Brefo, a model cocoa farmer, took the monarch through the process of preparing cocoa from the farm to the shed, explaining to him why Ghana’s cocoa is considered the premium quality product. Agyen started farming seven years ago after spending years in Accra and Israel where he had travelled to seek greener pastures which perhaps, never appeared green for him, after all. He said he was inspired by Kuapa Kooko Company which natured his ideals and trained him in agribusiness. With 27 acres of land, he used about two-thirds to cultivate cocoa, using the hybrid while coconuts, sugar cane and other crops occupy the rest together with some poultry. He has interspersed cocoa with tree species like Odum and Ofram to serve a dual purpose of providing windbreak and timber re-afforestation. He encouraged other companies to assist the youth to go into farming, especially as regard finance and land acquisition. He called on the youth who have family lands to start the cocoa business because it was really juicy. Agyen said he is the luckiest farmer to have hosted Prince Charles on his farm beyond the support he had received from Kuapa kooko Company. 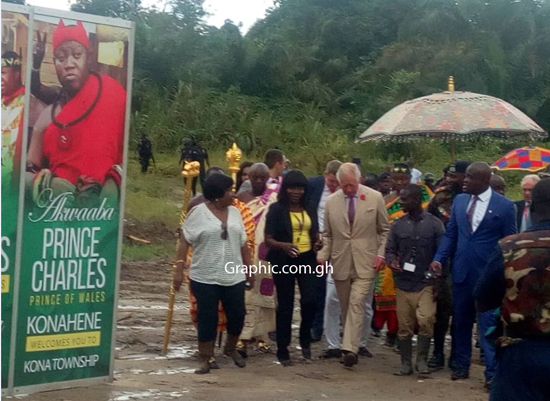 Officer in charge of Extension and Environmental Services at Kuapa Kooko, Frank Okyere, led a team to take Prince Charles through getting cocoa ready for consumption. The Prince acknowledged it is tedious work. Britain consumes an estimated 660,900 tonnes of chocolate a year, an average of 11kg per person per year, a figure that equates to about 3 bars a week. The farmers said they considered the Prince’s visit as one that will encourage them to do more to increases production but pleaded with the Prince to give cocoa prices a serious thought. More importantly, they want Prince Charles to use what he learnt on the visit to lobby for higher prices for cocoa so farmers can get better rewards for their toil. Ghana Agriculture News-The President of the Kuapa Kookoo Farmers Union (KKFU), Madam Fatima Ali has revealed the outfit’s decision to pay pensions to its member farmers who retire from active farming. Addressing the media at a special soiree held in Kumasi, Madam Ali noted that the pensions is to ensure that members have some livelihoods to live on after being part of the Union and also having participated in the group’s activities for a considerable period of time. The President, who recently won another four year mandate on behalf of the other executive also disclosed partnerships the company has reached with MTN-Ghana to ensure members have access to mobile phones that is toll free to enable them communicate and attend to pressing needs on the farm. 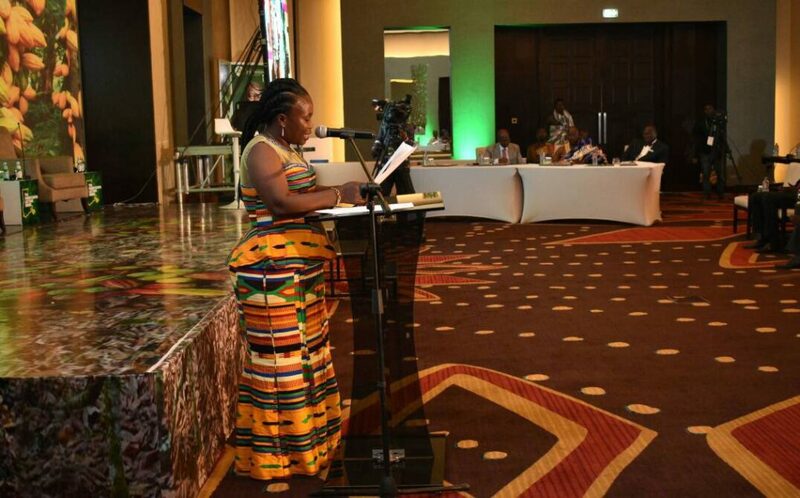 She also hinted of plans to fast track the period by which Kuapa Kokoo pays bonus to members aside the one government pays to cocoa farmers in the country for the work they do. ‘’We are committed to ensuring our member farmers benefit from every initiative the new executive are coming up with so that we can entice young and enterprising youth into our business and in farming in general’’, Madam Fatima posited. The President hinted of plans by the new executive to intensify efforts in upgrading the knowledge of its union members. Sensitization forums, field education trips as well as workshops will be periodically organized to ensure farmers apply the right kind of knowledge in their business, Madam Fatima noted. The Kuapa Kokoo Farmers Union, Madam Fatima mentioned is determined to make its farmers all round in terms of knowledge and effectiveness so that they can produce on a large scale and shore up their yearly yields. She promised to provide the union’s farmers with improved seedlings and extension services so as to enable the group cultivate on large scale all year round. ‘’I am happy to inform the media that these new executive is determined to apply every mechanism aimed at making the work of our farmers worthwhile as we deal with welfare issues, improved working conditions, pensions and incentive packages for the collective good of our members’’, Madam Fatima intimated. 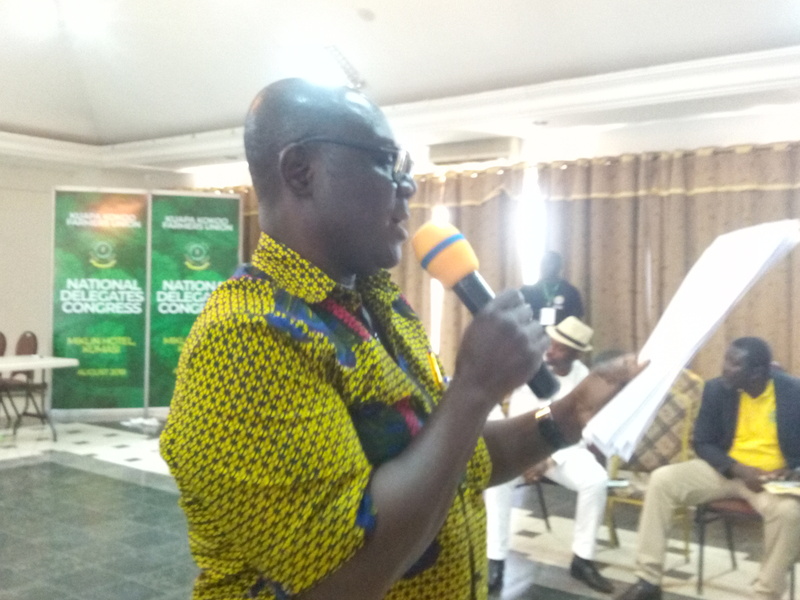 Hinting about the new direction the Kuapa Kokoo Farmers Company Limited, a licensed buying company with links to Kuapa Kokoo Union, the Managing Director, Samuel Adim Addo, reiterated the commitment of his outfit to make the activities of the company transparent. He noted the new executive of the Union as well as the company is resolved to fight all corrupt practices bedeviling the association. With the introduction of technology in the form of Tele-agric and Tele-medicine, the MD noted Kuapa Kokoo is bound to do well in business from now. In the 2017-2018 large crop season, the MD noted the farmer union was able to achieve 99% of its target as the LBC purchased a total of 59, 096 metric tonnes of cocoa from its farmers across the country. He noted the partnership with the Millennium Promise Alliance, a health focused organization is yielding dividends as farmers have enough incentives to do well knowing issues about their health and welfare is safe. Leading discussions at the forum, Chief Nat Nsarkoh, Director Millennium Promise Alliance tasked the media to show particular interest in the activities of Kuapa Kokoo. This, he noted will afford them the opportunity to sell the message and vision of the union to the public so as to encourage people into farming and into the right association of farmers. The transparent nature of Kuapa Kokoo and its activities, Chief Nat opined makes it imperative for the media to zoom in on them so that they could be used as a yardstick in measuring the success of co-operative farmer groups in the country. 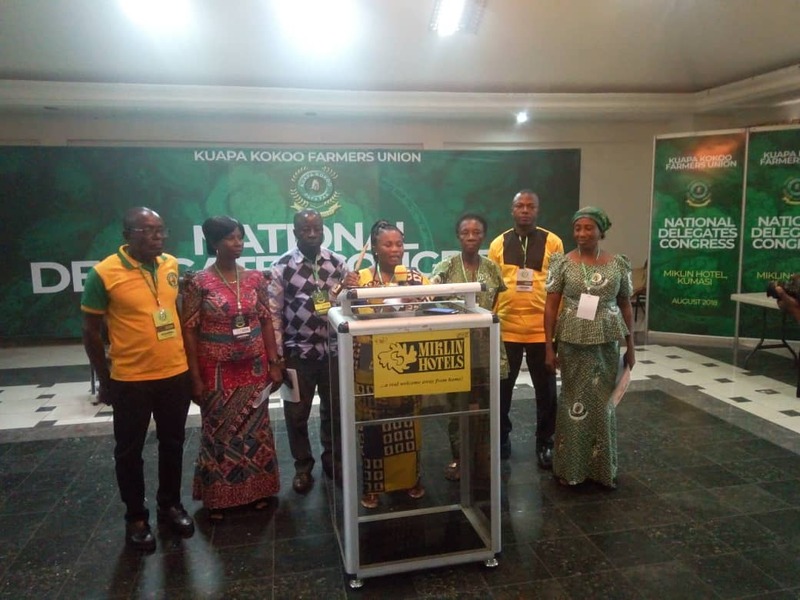 Elected executives of the Kuapa Kooko Farmers Union (KKFU) have pledged to run a transparent and an accountable administration within their four year tenure. The executives maintained that the administration will guide against discrimination, nepotism and bias towards members of the union. The executives have also pledged to prioritize the welfare of members and also ensure that policies that will enhance the needs of farmers are implemented. 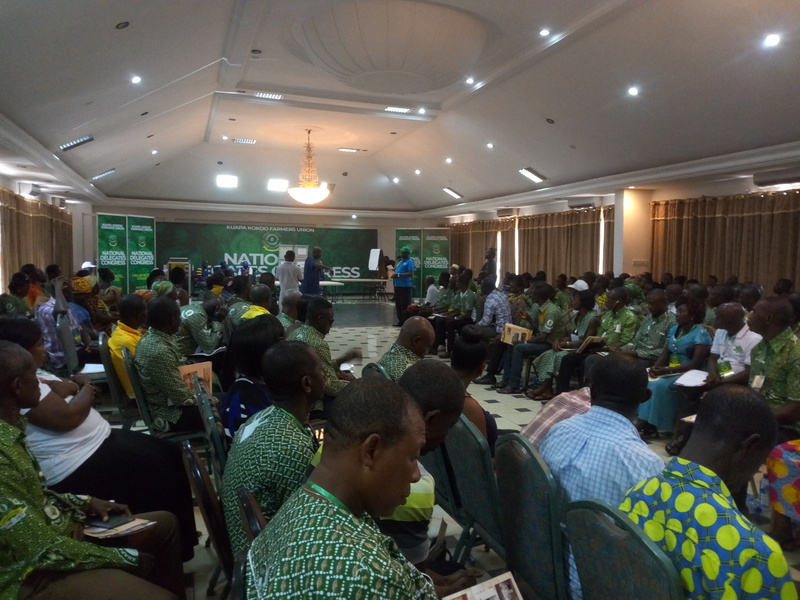 These remarks were made after the executives were successfully elected at the Union’s 2018 National Congress in Kumasi. 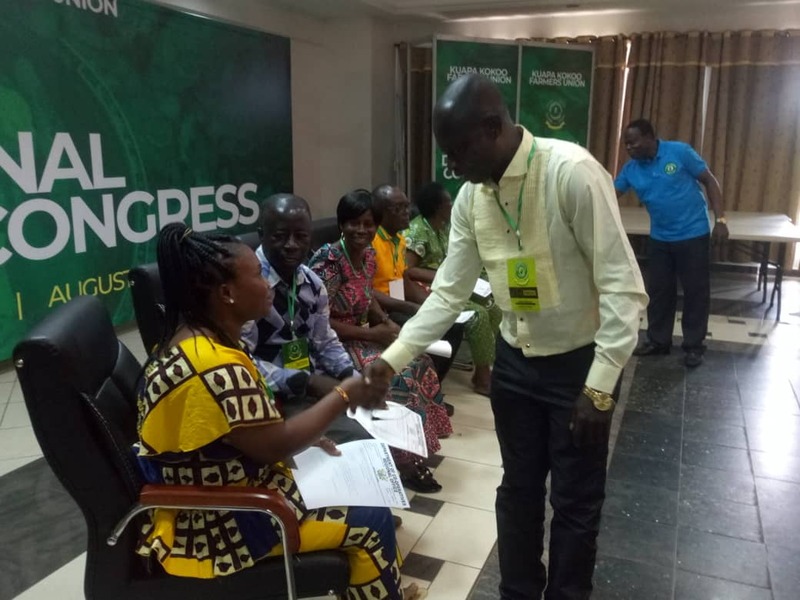 The elections were without hitches as delegates and the candidates comported themselves before, during and after the process. Incumbent President for the Union, Madam Fatima Ali, who went unopposed polled 158 Yes votes representing 93.5% to retain her position. 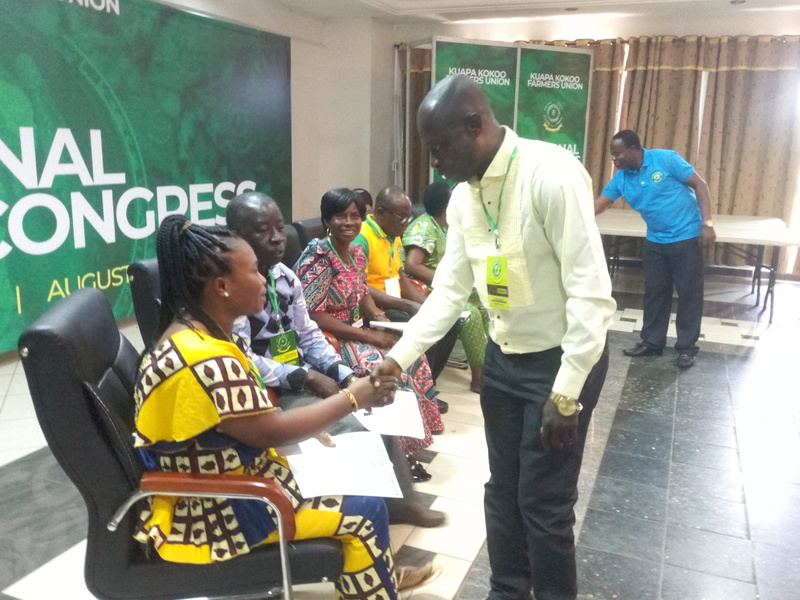 Speaking to journalists after the swearing in ceremony of the elected executives, the retained President for the Union, Madam Fatima Ali, said she and the other executives will work hard to prioritize the needs of cocoa farmers and other union members. She indicated that the leadership will also work at enhancing the skills of cocoa farmers through periodic training and capacity building to help them maximize their yields and minimize losses in the sector. “The main priority for the us as elected executives is the progress of Kuapa Kooko and the well-being of our farmers and other Union members. We will put in place friendly policies to ensure that farmers are able to increase their yields every season. We will ensure that there is no discrimination within the Union and we will also ensure that transparency and accountability will be effective so that the farmers can always have trust in the leadership”, she stressed. Madam Ali said part of the policies to help Cocoa Farmers was the introduction of Tele Agric Technology for Cocoa farmers and the Union members. According to her, the system was aimed at helping cocoa farmers to enhance productivity in the sector. She explained that the mobile phone innovation will allow for communication in local dialect to make interaction easy for farmers who need help from their Agric extension officersa and others. She further said Kuapa Kokoo has programmed anything pertaining to cocoa farming on mobile phones which has been supplied to farmers to teach them how to operate it. The Kuapa Kooko Farmers Union President emphasized that there was the need to replace old cocoa trees with new ones and the planting more trees to help increase productivity in Ghana’s cocoa sector. She indicated that leadership of the Union will train farmers on afforestation methods to get them to plant more trees on their cocoa farms to boost production. Madam Fatima Ali called on Government to distribute enough pesticides and other chemicals to cocoa farmers to help them prevent diseases and pests from destroying cocoa farms. She also appealed for adequate fertilizers for cocoa farmers to increase production levels in the sector. According to her, although Government has been providing farmers with the pesticides and fertilizers, the quantity should be increased and the distribution should always be timely and sustained. She called on all the union members to rally behind the elected members and leadership so they can work together towards the progress of the Union. Kuapa Kokoo, was one of the proud sponsors and a special guest at the event. The team took the opportunity to further inform visitors about Kuapa Kokoo’s achievements over the past twenty five (25) years. The Gender group had some of their products displayed to the general public. The products included Shower Gel, Liquid Soap, Washing powder, Bar Shop, Parazone, Hair Food, Hair Shampoo, Local Rice etc. All of these products were the works of the Kuapa Kokoo Women group from some selected Kuapa communities. Our booth attracted a lot of visitors (about 500 hundred people) including some special personalities such as the Chief of Tafo Osabarima Adusei Peasah and other Stakeholders. They were taken through the photo exhibits thus educating them about Kuapa Kokoo. Those who didn’t know of Kuapa Kokoo expressed interest in joining the cooperative after learning about us. Kuapa Kokoo branded souvenirs such as Pens, Calendars, Leaflets, Folders, Mugs and T-Shirts were given to those who visited the booth. The products displayed by the gender team were highly patronized by people at the events. Visitors were very impressed about the products and the extent to which the women farmers have been empowered with such skills. At the forecourt, speeches were said by the distinguished personalities present. The Executive Director of Cocoa Research Institute of Ghana Dr. Franklin Manu Amoah said in his speech that “it had not only generated innovative research outputs in the cocoa industry but can boast of a cocoa flavour laboratory, the first of its kind in Africa to improve on post-harvest activities of farmers to guarantee high quality cocoa in terms of flavour”. It was said that – The Cocoa Research Institute of Ghana (CRIG), has made available 100,000 cocoa seedlings for distribution to 25 farmer groups in the Eastern Region to help boost cocoa production. Mr. Nelson Adubofour (Executive Secretary-KKFU) received a seedling on behalf of Kuapa Kokoo. Added to that were 30,000 “emire” tree seedlings to provide shade and protect the young cocoa plants. Mr. Eric Kwakye-Darfuor, the Regional Minister, said CRIG’s contribution to the growth of the cocoa industry had been enormous. The Tafohene, Osabarima Adusei Peasah, in his speech also appealed to the government to do more to tackle bad cocoa roads. The opening durbar which started at 10:00am lasted for approximately four (4) hours. On the whole, it was worth participating in the event and positive impression about Kuapa Kokoo was created on the minds of participants.